1. Roots & Revelry: *Pictured above* This restaurant and bar is located inside the Thomas Jefferson Tower in downtown Birmingham. Not only is the food to die for, but the specialty cocktail menu is out of this world! The entire inside of R&R is covered in the most elegant marble and the outside patio is the perfect spot to enjoy the summer weather. 2. Habitat Feed & Social: This inside and outside rooftop bar is located on the top floor of the Grand Bohemian Hotel at Crestline Village in Mountain Brook. This place gives me total Alice in Wonderland vibes with all of the purple and gold accents on the furniture. My favorite part has to be that there is a plethora of seating and numerous fire pits out on the rooftop! So fun! 3. 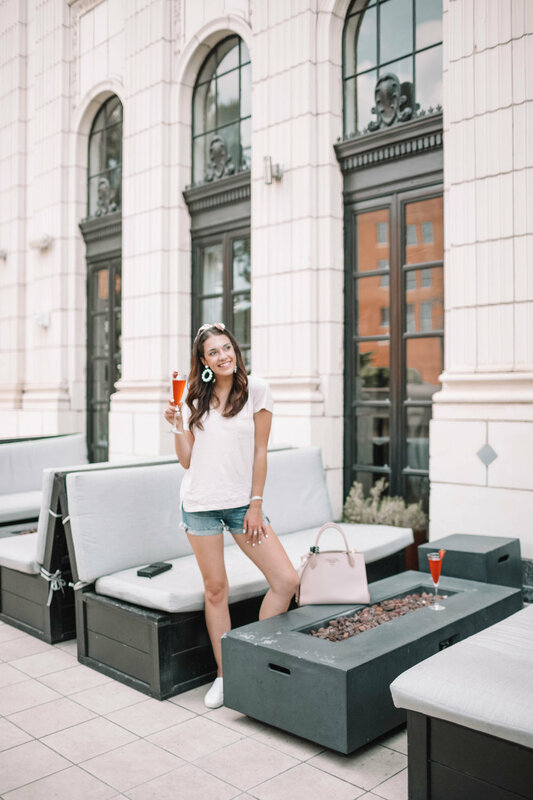 The Roof at Redmont: This rooftop bar is located on top of the Redmont Hotel in downtown Birmingham. This has to be my #1 favorite happy hour spot in Birmingham. With the gorgeous views of the city, along with very 'instagrammable' backdrops, I truly have never had a bad time here! You can find this Birmingham hot spot featured in one of my past blog posts here. 4. Moon Shine: Another favorite rooftop bar located on top of the Elyton Hotel in downtown Birmingham. Moon Shine also has pretty amazing views of the city skyline! They have great signature cocktails and an awesome social scene. They also have a fabulous selection of small plates that would be the cherry on top of a great happy hour! 5. Carrigan's Public House: Craft cocktail and beer bar located on historic Morris Ave in downtown Birmingham. The building has an extremely unique, rustic feel. In addition, the bar food is unlike any other I've ever experienced. They have great outdoor seating options and the roof is so much fun! Always a very popular happy hour spot after work for young professionals. 6. The Atomic Lounge: Looking to mix things up a bit? This lounge is a place where craft cocktails meet dive bar. Complete with a bubble machine, lava lamps, board games and wait for it....COSTUMES! You can borrow full body costumes to wear while sipping your cocktails. I'm not kidding, you seriously have to experience this one for yourself. 7. Soho Social: Head to Soho Social for great cocktails, mocktails and food! This high energy craft bar is located in Homewood. I've found that this is a great place to gather and mingle with your friends after a long day at the office. I grew up in Homewood and this is truly one of my favorite new additions! 8. Rojo: Rojo is a Mexican style restaurant with an extremely cool outdoor patio, incredible margaritas and sangria. The patio is covered and I mean COVERED in rainbow colored string lights. Wait until it gets a little darker outside and it is truly a magical atmosphere. Not to mention that their drink menu is out of this world. To me, nothing beats a fresh margarita and queso! 9. Collins Bar: The coolest part about Collins Bar is that they tailor make your cocktails. You simply tell the bartenders what you like and they hand craft a unique cocktail especially for you! I've heard from friends that their bartenders were all required to attend Mixology school, which makes since because their cocktails are so flawless. The atmosphere is also super cool, a unique touch is that there is a Birmingham themed periodic table of the elements hanging over the bar! 10. SAW's Juke Joint: Looking for a relaxed atmosphere and a great time? Well, SAW's Juke Joint definitely hits the mark! They usually have great live music and every time I go here, I have such a fabulous time! They are known for their signature Bushwhackers. When you drink one of these, you'll understand the meaning behind the phrase "one and done"! *Insider Tip*- If you want to get some great discounts to local bars around Birmingham, I suggest checking out Around Town Passbooks. This company partners with local bars and strives to provide their customers with the best deals and incentives around town! Their passbooks are now available for pre-order and I think they'll soon be a HUGE hit! You can learn more by clicking here!